During today's patent trial, Apple's attorney Harold McElhinny drew attention to Samsung's interrogatory response from September, 24 2012, where the company stated, "Samsung is not currently seeking indemnification from any third party." 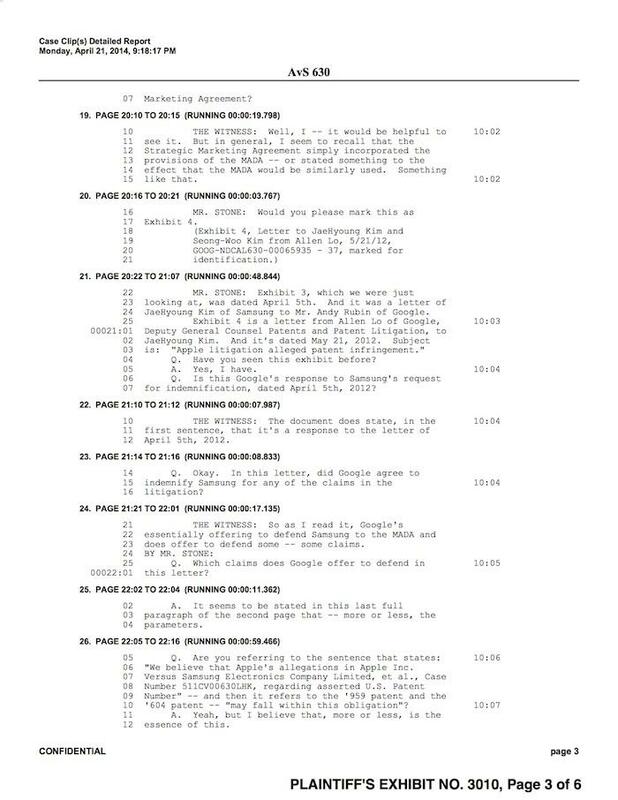 That set up McElhinny to next outline a video deposition with Google counsel James Maccoun, who in August 2013 outlined that Google and Samsung had actually formed an agreement where Google promised to defend Samsung from certain patent claims Apple was asserting. 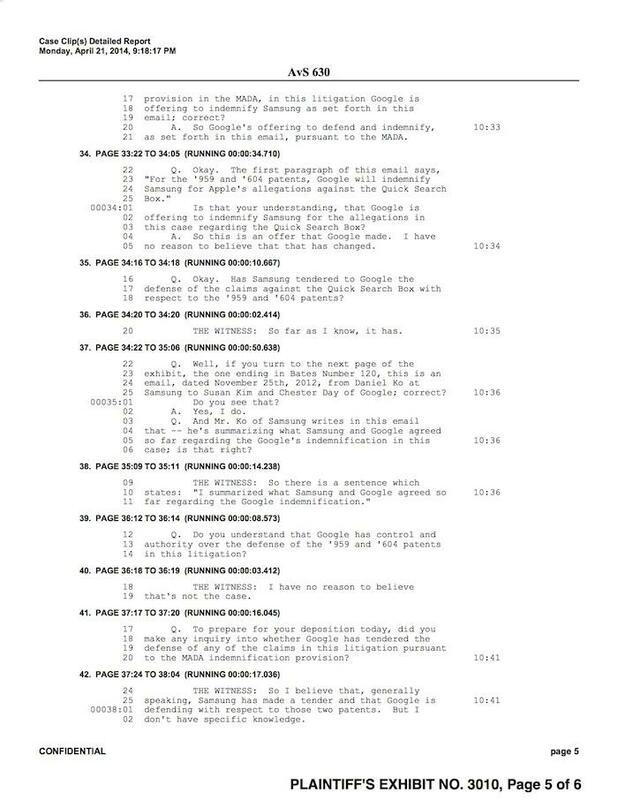 According to the deposition, Maccoun was asked "Is there any agreement with Samsung to indemnify it for defense costs or liability related to this litigation?" His response: "There is a Mobile Applications Development Agreement, and I understand that to be an agreement between Google Inc. and Samsung relating to indemnity and defense." Maccoun was then more pointedly asked, "Pursuant to that agreement that you just referred to, has Google agreed to indemnify Samsung for any liability or defense costs associated with this litigation?" He replied, "So I understand that Google is defending Samsung and that this is reflected by emails. The —I think that's probably a good way to characterize it." 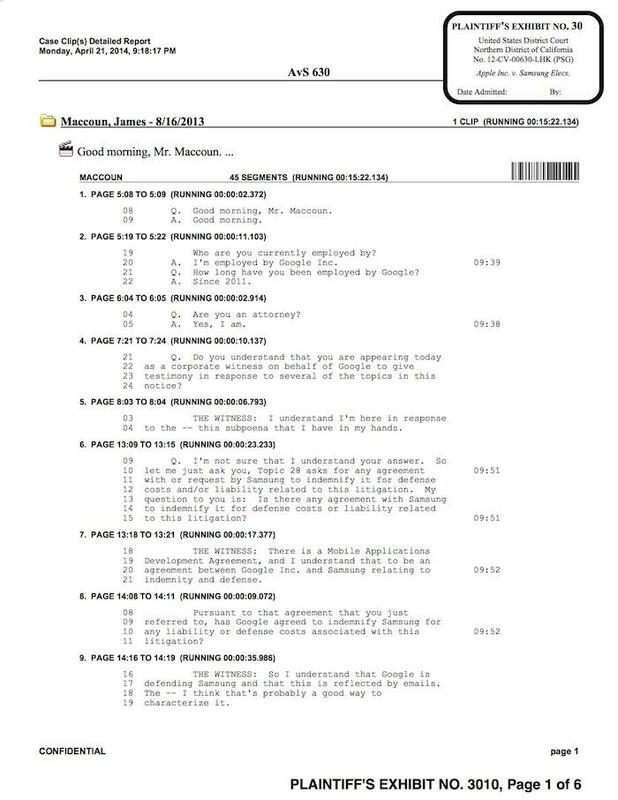 Maccoun was then presented with "Exhibit 3, Letter to Andy Rubin from JaeHyoung Kim, 4/5/12," an email dated several months after Apple sued Samsung in late 2011, but more than five months before Samsung presented answers that flatly denied any indemnification agreements. Maccoun said the email was "the first request that I'm aware of" that outlined "an agreement between Google and Samsung" which included "provisions relating to defense and indemnification." 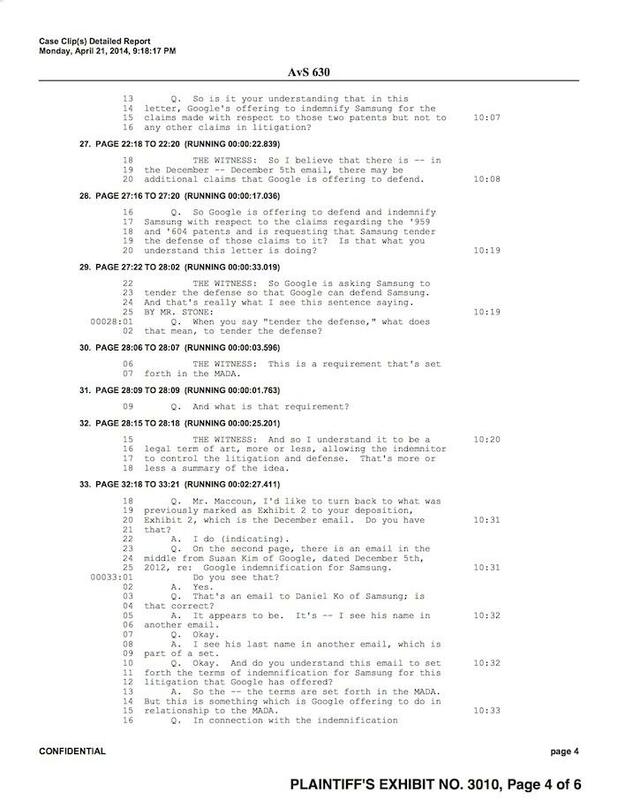 Apple then presented Maccoun with "Exhibit 4," a letter "from Allen Lo of Google, Deputy General Counsel Patents and Patent Litigation," to Samsung's JaeHyoung Kim, dated May 21, 2012. The email, titled, "Apple litigation alleged patent infringement," was described by Maccoun as "Google's essentially offering to defend Samsung to the MADA and does offer to defend some —some claims." Apple counsel then drew attention to a line in the email stating, "We believe that Apple's allegations in Apple Inc. 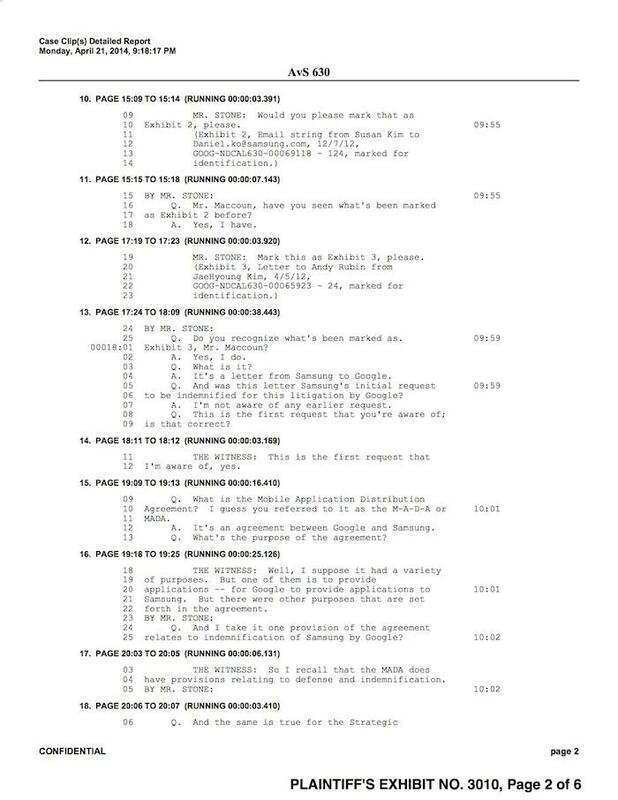 Versus Samsung Electronics Company Limited, et al., Case Number 511CV00630LHK, regarding asserted U.S. Patent Number" [refers to the '959 patent and the '604 patent] "may fall within this obligation." Maccoun described that line as "Google is asking Samsung to tender the defense so that Google can defend Samsung," explaining that "tender the defense" was a "legal term of art, more or less, allowing the indemnitor to control the litigation and defense." Asked, "Has Samsung tendered to Google the defense of the claims against the Quick Search Box with respect to the '959 and '604 patents?" Maccoun replied, "So far as I know, it has." Statements from Google's attorney reveal that Samsung took Apple's two separate 2011 lawsuits very seriously, and that it thought that Google should not only take responsibility for damages related to infringement of Apple's patents, but should also "control the litigation and defense." Meanwhile, Samsung wrapped up its own patent offensive against Apple by claiming relatively minor damages related to two patents it bought in 2011 after being sued by Apple. The first was patent Samsung aimed at Apple's FaceTime. However the patent in question has not only already expired, but also covers the general concept of sending video "over low band width [sic] lines." 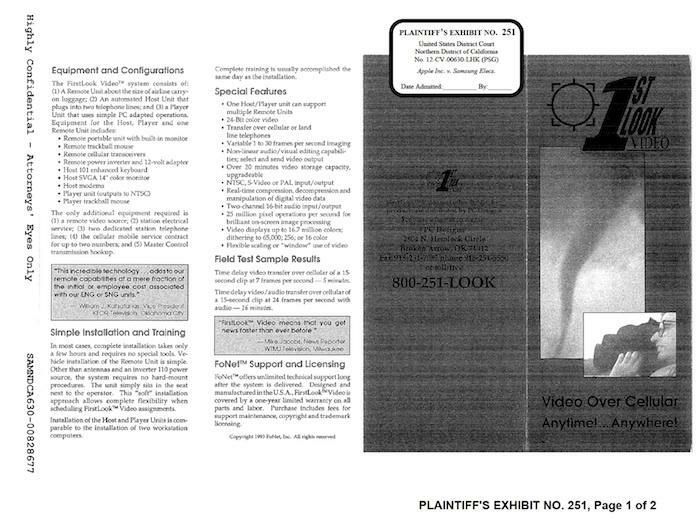 The 1990s filing refers to a feed where the "audio/visual signal can be NTSC, PAL or Y/C video." 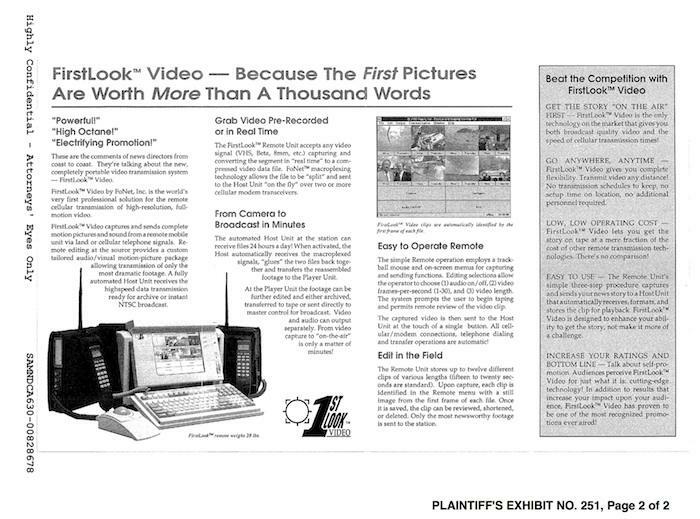 The invention covered by the patent was an old fashioned cellular system for broadcasting video named "FirstLook Video," detailed in a 1993 brochure (above) that described it as "a Remote Unit about the size of airline carry-on luggage," "an automated Host Unit the plugs into two telephone lines" and "a Player Unit that uses simple PC adapted operations." Samsung's countersuit involves two patents it acquired after being sued by Apple, and stands in stark contrast to Apple's patent offense, which focuses on four feature patents that Samsung meticulously detailed as features it needed in its own products in order to compete against Apple, including Slide to Unlock and Apple Data Detectors. Samsung has refused to license the patents on Apple's terms, which currently demand more than $2 billion in royalties and lost profits.